You’ve probably heard the saying that the kitchen is the “heart” of a home. I couldn’t agree more. But I’ll take that one step further and add that the kitchen island is what keeps that heart pumping. Kitchen islands are iconic. They hail back to the good old days when families spent time together, eating, cooking and just enjoying each other’s company. They are the modern day version of the kitchen table. Instead of being snuggly wrapped into the built-in café or sitting uncomfortably on metal chairs around the linoleum topped red dinette, families congregate at the island. The kitchen island has become not only the lifeblood of the kitchen, but also a multi-dimensional fixture in most homes. 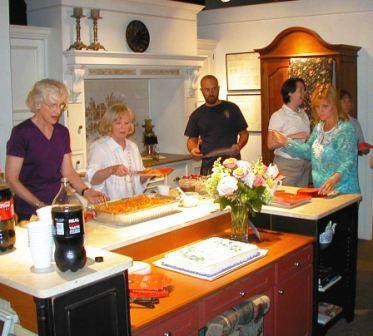 The large surface of an island is the perfect place to serve a buffet style meal, a critical ingredient in over-scheduled large families. It is rare that parents and children all sit down together at the dinner table anymore. The kitchen island offers a perfect solution. One person can be eating dinner while the other works on homework. The versatility of the island makes switching shifts and priorities a snap. 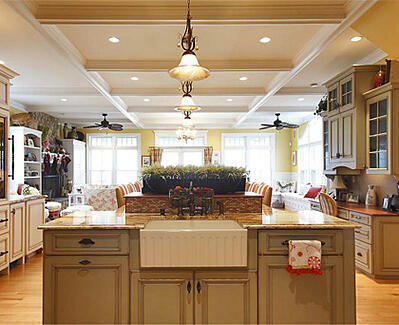 Kitchen islands can be designed in virtually all shapes and sizes. They can be floating or fixed, offer open or closed storage and can be multi-tiered or flat. Kitchen islands can be adorned with funky lights and cool and helpful amenities like built in knife blocks or cutting boards. They may be the center of the kitchen, complete with cook-top, stove or sink. Or, perhaps they act as the ideal sidebar to the kitchen collection, providing a respite from the hustle and bustle in the heart of the home. Kitchen islands can be configured to accommodate under-counter seating, bar stools or even custom-built swinging chairs like you see at the bowling alley. The kitchen island acts as a magnet, drawing people, paper and projects toward it. It might even attract a meal or two. An island can be sturdy enough to support a DIY task, subtle enough to cater to an intimate crowd and stunning enough to take your breath away. But no matter how different they are, every kitchen island has one thing in common… appeal. It welcomes us home after a long day, eager to hold our keys and ease our burdens. It beckons us to have a seat, spend time with the ones we love and indulge in the simple pleasures of home. Our kitchen islands keep the blood pumping through every area of our lives and our homes.